Lisa Halter: Tell us how you got started in the art world and what a typical day looks like. Jen Dragon: I went to Purchase College for visual arts (class of ’84) and have since been involved with teaching, curating and promoting art in the Hudson Valley and Catskills region. I am lucky to know many gifted artists as friends and through them I have met many more! I am a one-man band in my business: I do all the art installations, art packing, shipping, marketing, selling, invoicing, bookkeeping, program planning, exhibition curating, press releases, marketing promotion, advertising, social media….you get the idea! So my day is a whirlwind of wearing all of these hats and switching from one to the other as needed. Lisa Halter: What is the biggest project you/Cross Contemporary Art have worked on to date?" 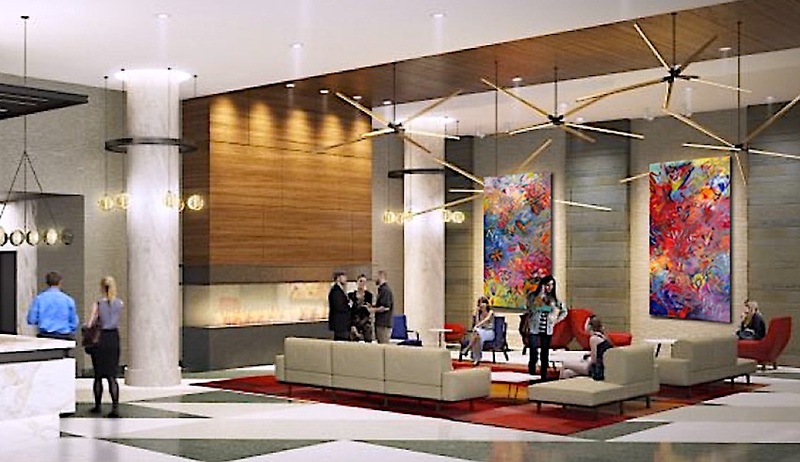 Jen: That would have to have be the commission, creation and installation of two nine feet high oil paintings by Ford Crull in the lobby of The Bartlett luxury apartments in Washington DC. 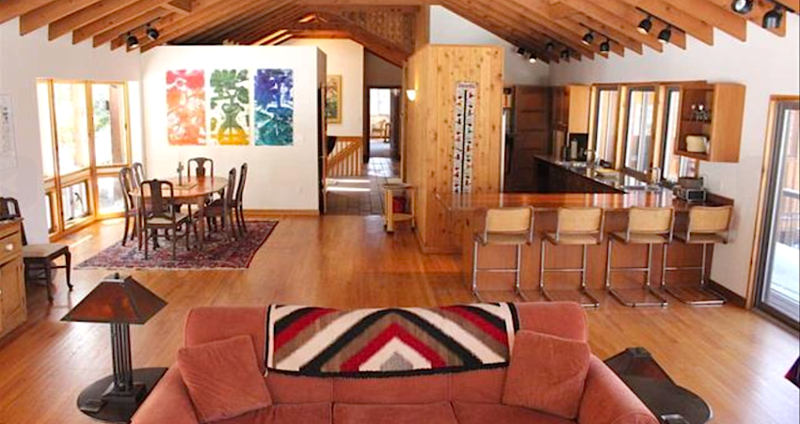 Lisa Halter: When did you start staging homes with art and what was your first assignment? 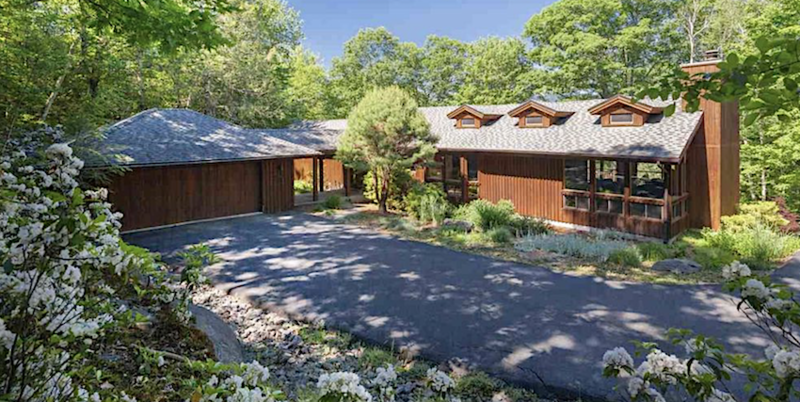 Jen: My first house staging was a large-scale architect-designed home in Mount Tremper. 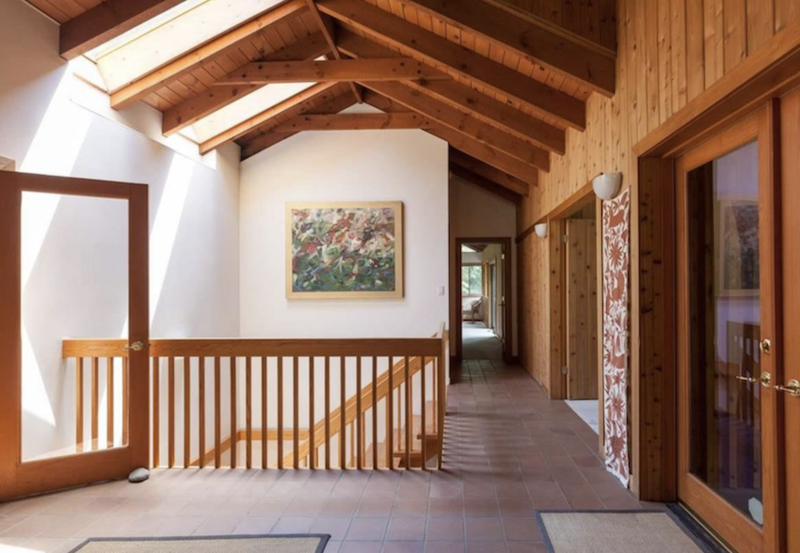 There were high ceilings, large windows with mountain views and wood paneling featured throughout that was a challenge to the curation and installation. Traditional art tucked in a frame can look small and cramped in soaring spaces. Wood paneled walls are already dark so rooms needed to be brightened with light and color. And most importantly, we didn’t want to compete with the stunning views outside the windows but we did want to create an environment that complemented the nature around the home. So the art had to harmonize with the interior ambience as well as with world outside. 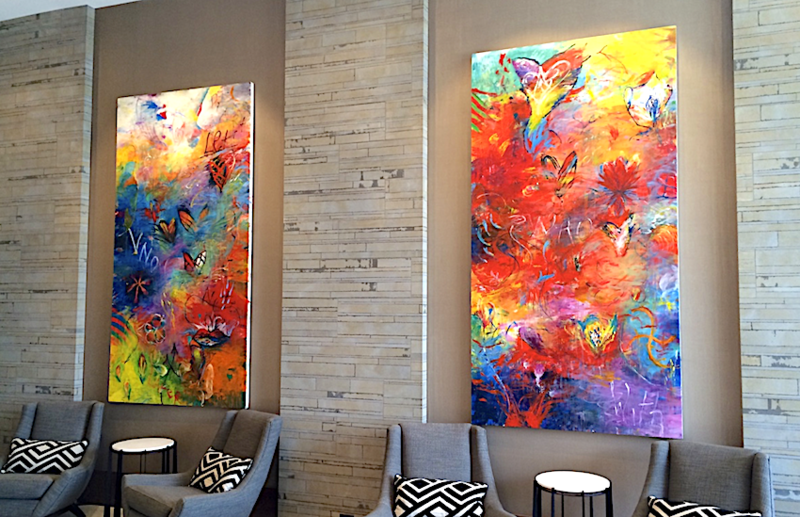 Lisa Halter: How do you go about adding art to a room and what is the most important factor? Jen: The first thing I do is consider the character of the house and its furnishings. Is it Modern? Traditional? Rustic? Bohemian? Mid-Century Modern? Each house has its own character and the art needs to enhance it’s personality. The next crucial factor is the goal of the marketing and sales vision. 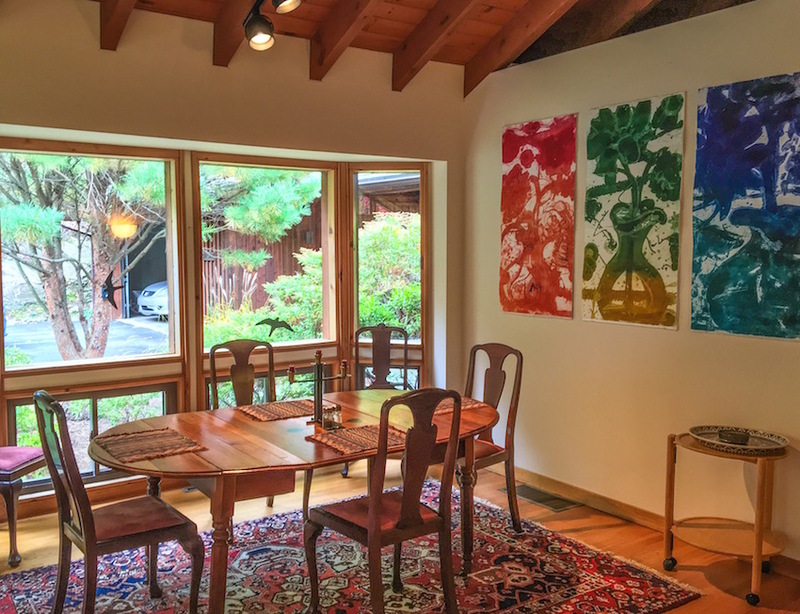 In the case of the Mount Tremper home, the owners were still using the home as a weekend retreat, so the art had to be in harmony with their need to relax but also reflect a sophistication that would help them achieve their sales price. The goal of staging a home with art is to make it feel more valuable. Expensive art helps the seller reach their desired sales price as it changes the way the home is percieved. In the Mt. 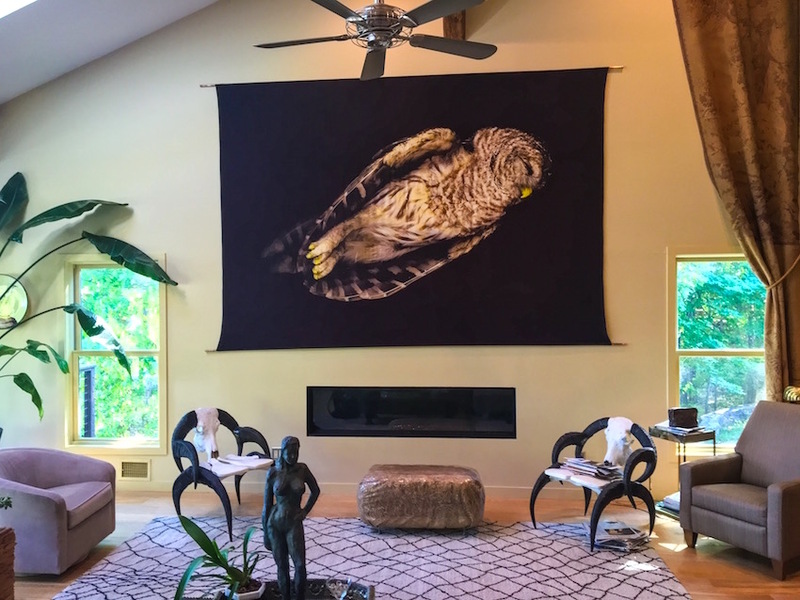 Tremper project, we met with the owners and showed them a selection of artwork that was large enough to suit the scale of the main rooms and then some pieces that were intimate for more private spaces. We also looked through the art the owners already had and rehung pieces that were better off in other places or needed to be adjusted to suit the proportions of the space. Lisa Halter: Do you prefer to work on your own after a place is staged with furniture, or to work closely with an interior designer staging from the start together? Jen: I like the challenge of limitations. Its just the way I am. So if the house is awkward or furnished strangely, I like to change the perception of these limitations with skillful installation. I also enjoy working with interior designers as well as directly with the client because the dialogue surrounding art placement and the optical illusions that can be created is interesting to me. Most importantly, I work closely with the realtor because they know best the goals of the client and what features best help sell a house. The more insights people give me, the more fun it is to reach a sort of consensus that comes from the wisdom of the “hive mind”. Lisa Halter: What advice would you give to someone that wants to add art as part of their staging/selling process when the home is filled with their belongings. Jen: It is probably best to remove all personal photographs and posters. You want to create an environment where the buyer can imagine their life inhabiting the space and photos of children or personal moments are a distraction and it makes the home feel like it can never be theirs own personal space. And posters need to go because they feel cheap and can diminish the perception of the home’s value. Lisa Halter: How is your service priced? Is it a flat price? Or, per piece or per room with a month fee? Jen: I do a minimum of a three month contract, paid in advance. 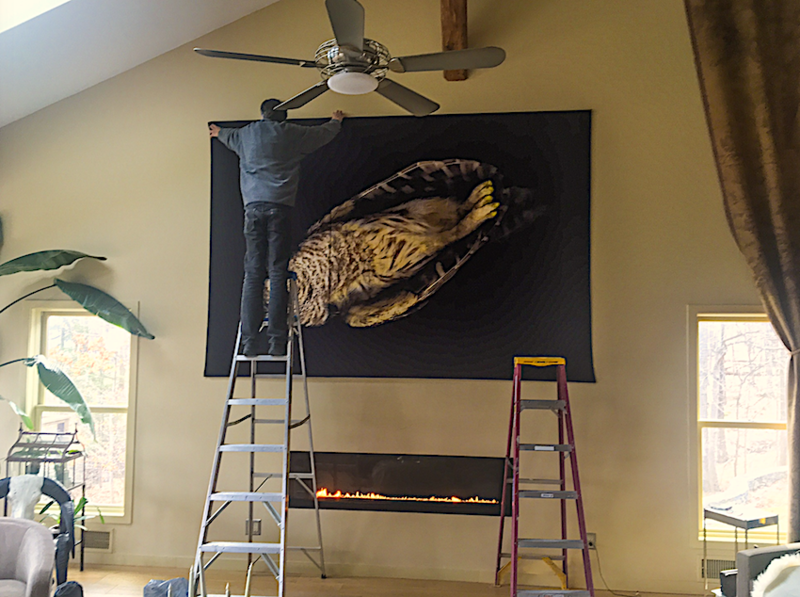 The cost per month is 4% of the value of the artwork plus a one-time installation fee that can vary depending on the size of the job. 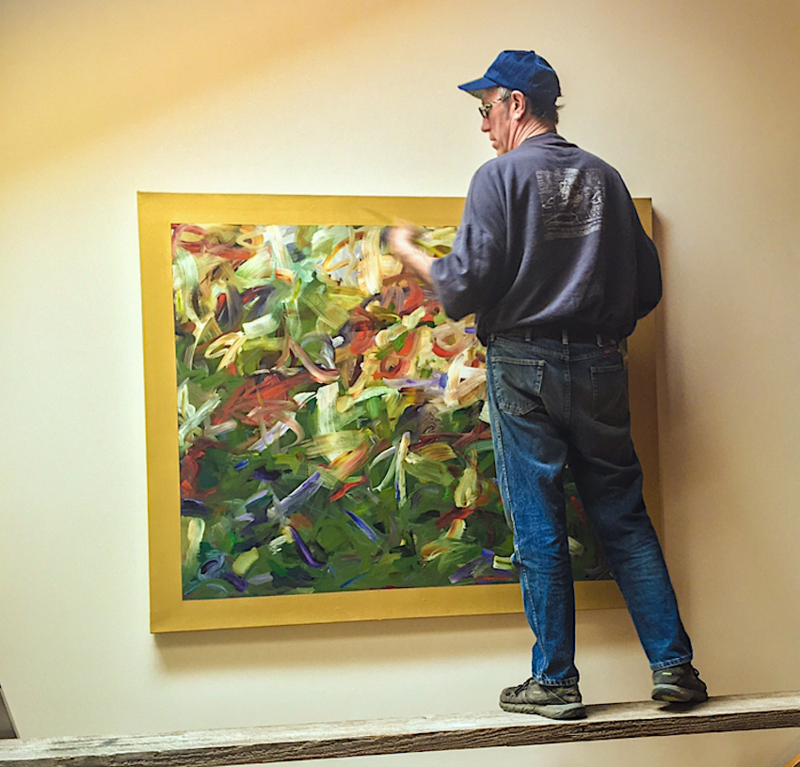 The owner is responsible for insuring the work which usually means submitting an itemized list of the artwork and its value to their insurance company and increase their coverage for the duration of the installation. My gallery is unique in that if the renter ends up wanting to purchase the artwork, they receive credit for the rental price paid towards the purchase price of the art. Lisa Halter: Has anyone bought a house and insisted on buying the art with it? Jen: That has happened once and we were able to wrap the purchase of the painting into the mortgage however that was a while ago and there may now be restrictions on that sort of thing. Lisa Halter: Do you tend to hang art from local artists from the Hudson Valley or do you have an art collection from artists across the country? Jen: My gallery is focused on mid-career artists from New York City, Hudson Valley and Catskills region (which is a very big net considering how many artists live in this area!). 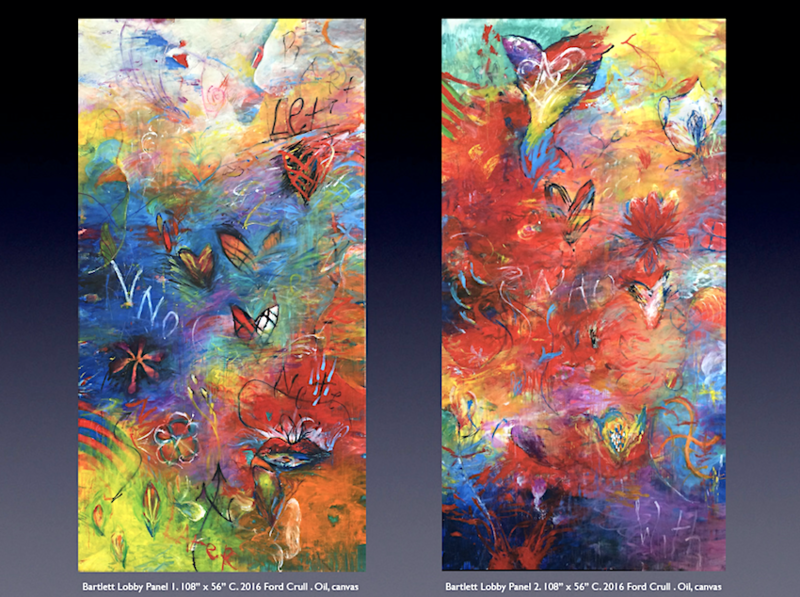 I represent artists whose work has either been exhibited in museums or are part of museum collections. This may mean a higher price point but then the art has more investment value to the collector as well as being a beautiful part of their life. Lisa Halter: What are your favorite art and design magazines or websites for inspiration? Jen: I am a huge reader and spend a lot of time staying current with trends both local and international. I have always been fan of Architectural Digest for ideas about art installations and I read Art in Americamonthly from cover to cover. Online, I find out about what’s new in contemporary art by subscribing to NYArts Magazine, Brooklyn Rail, Hyperallergic.com and Vasari21.com. My resources for lifestyle and local art news the the Hudson Valley are RollMagazine.com, Chronogram, The Country and Abroad, Upstaters, Visit Vortex and The Almanac Weekly (Hudson Valley One). Lisa Halter: What is the most memorable career advice someone gave you? Lisa halter: What would be your dream job? Jen: I would have to say that I have my dream job now! However, I have room for growth and expansion and I look forward to someday having staff. Lisa Halter: What do you love most about living and working in The Hudson Valley? Jen: After living here for 35 years, I would have to say that the reason I was drawn here is the reason why I have stayed here: the natural beauty has always inspired me and the creativity of the people who live here continues to encourage my own creativity. Lisa Halter: It’s five o’clock on a Friday, where will we find you? Jen: My work week is from Thurs- Mon so 5pm Friday I am most likely at the gallery gearing up for my busiest days which are Saturday and Sunday! Be sure to follow Cross Contemporary Art on Facebook for Jen's next opening and give her a call to see her line up of artists and art for staging your home.